Sometimes Uber CEO Travis Kalanick gazes down on the street from his office window in San Francisco and wonders, "Why aren't all of those cars Ubers?" "The world would be a better place," Kalanick said during a talk at the Dreamforce conference in San Francisco on Wednesday. An all-Uber city wouldn't have traffic or parking problems, pollution would decrease, and unemployment would drop, according to the Uber CEO. 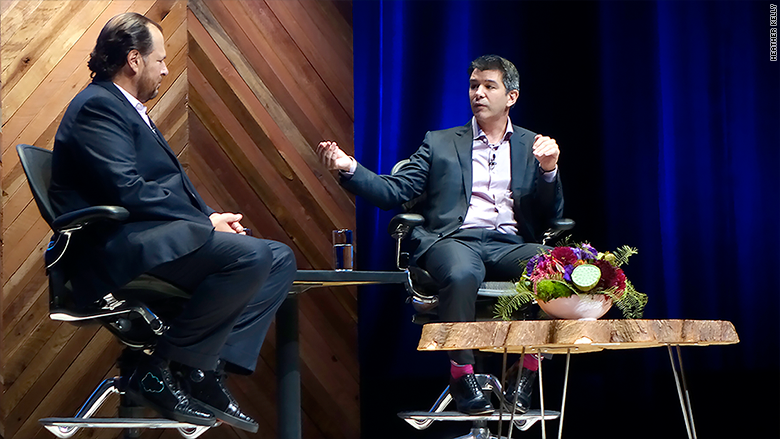 Salesforce (CRM) CEO Marc Benioff and Kalanick talked on stage for an hour about Uber's origin, company culture and driverless cars. The benefits of his Ubertopia would multiply when driverless cars become the norm, Kalanick said. Death and injuries from car accidents would almost disappear. Prices would drop low enough that people in under-served areas -- those who can't afford cars and don't have access to public transit -- would be able to hail an Uber. As for all the drivers who'd lose their jobs to robots? "I think we have 150 years of history of, when new tech comes out, there's a new thing for people to do," said Kalanick. "Eventually technology finds a way." That new thing could be shorter work weeks or different jobs, though Kalanick did not specify what kind. Looking a decade or more into the future might seem ambitious for any other five-year-old company, but Uber has had an unusually meteoric rise. The ride-hailing service is now in more than 300 cities and sees an average of 1,000 rides per minute around the world, according to Kalanick. Next, it plans to push newer services like Uber Eats, which taps its network of drivers to deliver food locally, and Uber Pool, which is like a paid carpool. Kalanick says Uber Pool is part of a bigger plan to make Uber cheaper than owning a car. The friendly interview included bits of flattery and back-patting ("You're an incredibly empathetic person," said Benioff.) It did not address controversial issues like the many protests against Uber around the world or the drivers who are suing the company for employee benefits. Kalanick, fresh off an appearance on The Colbert Report, was smooth and amiable. "We don't want to be like the taxi guys that came before us," said Kalanick. "We're a tech company, we want to embrace the future."